Introducing from Petzl the incredible e+LITE (E02P2) Headlamp. Extremely compact weighing in at only 27g without packaging, the e+LITE can do many things for one it can function adequately in extreme temperatures ranging from -30C to +60C as well as being waterproof up to a depth of 1m! Included in the packaging is a protective case which is one of many security features on the e+LITE, another being a locking switch designed to prevent accidental operation of the headlamp and yet another being that this model in particular comes with a whistle to help get you out of any tricky situations. Another great set of features about this headlamp is its ability to adapt. The e+LITE can be worn not only around the head, but around the wrist, neck or even on any thin-edged object thanks to the integrated clip too! Down to the actual light of this headlamp it has not only a strobe signalling mode, a red light beam to help preserve night vision and a 360 degree angle of swivel on the source of light itself, but the normal light of this headlamp can shine up to 19m and one battery alone can provide four consecutive nights of lighting (that’s 45 hours to you and I!). Another thing to brag about the battery within this product is that the product itself can be stored away and forgotten about even for ten years and remain to be fully operational as if bought new that day. 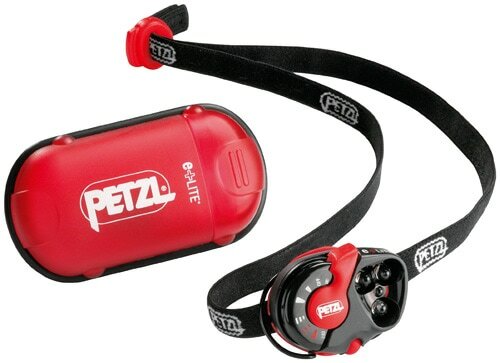 Surprisingly cheap at an unbeatable £22.80 inc VAT the Petzl e+LITE is an outstanding deal for anyone who thinks it could integrate into their hobbies or lifestyle and even for those who don’t think it will it would make a great birthday present to someone who is just bound to adore this gem of a product.